This Thread is for discussion of the movie 'Terminator', as #2 in a series of Rewind Movie Nights. * The Deadline : 12:00 Noon GMT on Friday 4 February 2011. * If you wish to participate, you must watch the movie before the above deadline. * This thread will only be unlocked once the deadline passes. At that point, all discussions can commence! "Hey, I think this guy's a couple cans short of a six pack." So I watched the original 1984 version of "The Terminator" last night to support Paul's genre change to 80's action. I've always been a fan of the Terminator flicks and while T2 is still a 'wow' for me from a special effects angle.. the original still is effective from a gritty/creepy type of experience. Chet from "Weird Science" is having a bad week.. first he gets his hair colored blue and spiked and then refuses to give his clothes to The Terminator. Linda Hamilton .. Sarah Conner's Jetsons t-shirt .. so awesome! Did Lance Henriksen have some great flicks in the 80's.. The Terminator, Aliens, Near Dark, Pumpkinhead, and Survival Quest? btw, Ronnie did you ever watch it? I kinda prefer the title.. "The Phonebook Killer"? How did Tech-noir come up with a cover charge of $4.50? Probably went up a little after 'Terminator Night'.. I've always thought Sarah Conner's roommate Ginger was one cool chick.. that flashy purple robe and her jamming to Linn Van Hek's "Intimacy" were major bonus points. I just learned how 'Slider' got his nickname.. crashing & burning all over the bedroom trying to fight The Terminator. One thing that always bothered me was after The Terminator smashed the Police car into the wall and the cops arrive.. he is gone.. I mean he is 20 feet away from finishing off Sarah Conner, but runs instead because he's a bit banged up? The Terminator's eyes moving back and forth like a surveillance camera was a nice touch. Oh the Paradox of it all.. If Kyle Reese doesn't get sent to the past to protect Sarah Conner, then John Conner doesn't exist in the future to send him. Mindtrip!! 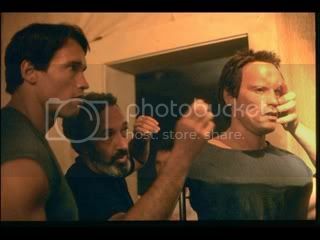 Always thought the animatronic Terminator putting on the shades was creepy awesome! The infamous "I'll be back".. sweet how Arnold sizes up the structural integrity of the Police station right before he unleashes that masterpiece of a line. btw, I'm starting to realize why Sarah Conner is struggling to get a date .. and it's not because of that hideous tie-dye t-shirt and Leather Tuscadero hairdo. 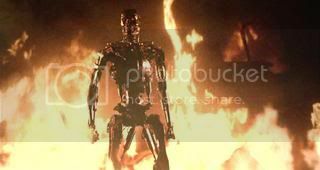 Best pickup line ever .. "It was a chance to meet the legend" wait he just topped it "I came back through time for you"
The Terminator walking out of that tanker truck inferno is still an amazing moment in cinematic history.. it destroyed Sarah & Kyle's happy ending.. but still wicked! Wild that Arnold Schwarzenegger was originally asked to play Kyle Reese, but he talked James Cameron into playing The Terminator. There is an awesome scene between Kyle and Sarah about taking out Cyberdyne Systems to change the future that was in a director's cut I saw once.. it was a great scene that worked in my opinion. While I had fun, I'm thinking the next movie should probably be "Grease 2" because a choice of being chased out of a Techno Club by a terminator just doesn't quite measure up to a night hanging out with cute girls dancing to "Let's Bowl Tonight".. Very cool observations once again Valley! I also watched this classic movie yesterday. This is still the best Terminator flick and it will always be. and it includes ultra classic score composed by Brad Fiedel. Arnold was just going to hit big and he decides to play the bad guy. And how right he was, he became even bigger star. Always loved Linda Hamilton and her trademark hairstyle. And Ginger is indeed a very hot chic, sadly Bess Motta didn´t do much acting after this one. Lance Henriksen is a legend and his scenes with Paul Winfield are great. Love the Tech-noir scene and the Tryanglz tunes they are playing. The truck scene and the ending are simply breathtaking. I still remember how scared i was when i watched The Terminator first time. It doesn´t get much better than this! * Bill Paxton has come a long way! * Always love when my favorite electronics make a cameo...dude walking down the street with a ghetto blaster on his shoulder, right after Arnold goes gun shopping. And Ginger's walkman....sweet! The scariest part of the movie is when Arnold tramps on those vintage headphones...ouch! * A great example of 80's fashion and culture...bar scene in particular. * Is there an 80's action flick in existance that doesn't have an......Uzi?! It's been a number of years since I've seen this classic, and it still certainly stands the test of time. 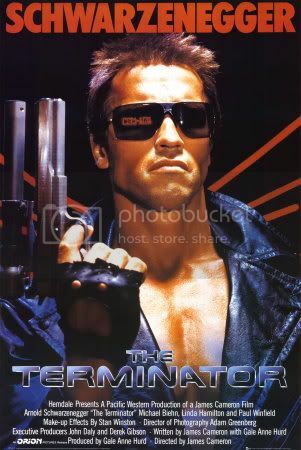 Who would ever have guessed that a weight lifter from Austria would go on to become the biggest action star of the 80's...and....who would ever have guessed that The Terminator would go on to beocme the Govenor of California! There are many funny lines in the movie too. The punks that give Arnie stick make some great remarks. The dude in the gun store mentions that any of the weapons are ideal for home defence. Arnie says to the super/cleaner ^&*%you $#%hole. Matt says, "Dont' make me bust you up man." The bum at the start says, "That son of a ... took my pants." The film is filled with great humour. I can still sit back and laugh through this. IMO it still remains as one of the best movies ever made. Rewatched The Terminator once again, still one of the best movies ever made. This just oozes class in so many ways! I rewatched Terminator as well, it's been awhile. Funny how certain movies have a big impact on you depending on when you see them. I realized toward the end why I drive a Jeep and have a German Shepherd.... I met Michael Biehn a few weeks ago and got his autograph. I'm sad to say he didn't look good. He is one of my favorite '80's actors.